Amazon is offering the Mpow Water-Resistant Mechanical Keyboard for just $27 when you use promo code 6VDJXI9J at checkout. That’s a 46 percent discount and the lowest price we’ve ever seen. The Mpow Water-Resistant Mechanical Keyboard is a mechanical keyboard with some serious tactile feedback for those of us who desire it. Each key is controlled by a separate switch, which ensures that every key you press registers simultaneously and accurately, whether you’re using it to type a paper or for when you’re playing an intense game. 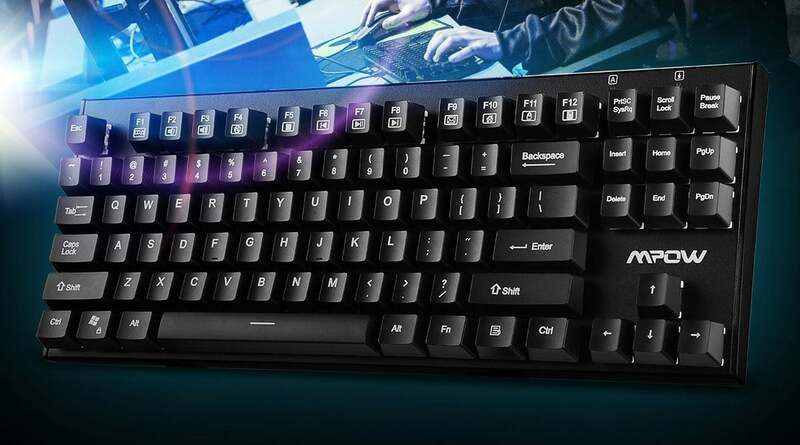 According to MPOW, this keyboard is made of top-grade ABS plastic and metal, with a matte texture that can withstand up to 60 million keystrokes. Not bad! It’s also compatible with every major desktop OS including macOS, of course. I already have a Logitech G710+ keyboard, but it took up too much room. Hence, I searched online and found this product. It’s only been about a day but this is a great keyboard. I love typing, so the sound of the keys registering at such a high frequency is always delightful. Plus, I play a lot of video games, so it makes it easier to play, however, only when you add additional o-rings to the keys does it register at a much quicker rate. Overall, this is a great product, only recommended for those who like to type with loud switches and/or if it’s your first mechanical keyboard. Overall, this seems like a great mechanical keyboard, even if you like your Magic keyboard. Plus, it’s water resistant which means you can be as clumsy as you want and not worry about your keyboard frying.